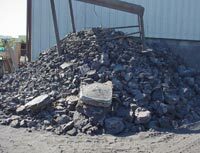 A concerted effort to beneficially reuse and recycle plant waste started in November 2006 when the chief financial officer of Hensley Industries complained about the soaring cost to landfill the facility's spent foundry sand. Tipping fees and transportation had peaked at just over $60,000 per month during mid-2006. Except for a portion of metal reclaimed from furnace operations, at that time Hensley didn't recycle anything. The company's environmental team investigated potential beneficial reuse applications and end users for its spent foundry sand and furnace slag as well as options for recycling office paper, cardboard, and wood waste. With limited available physical space, logistic planning for material movement, segregation and storage were very important. Equipment and labor investment had to be minimal. I, Diana Lundelius, am the company's environmental manager. With the help of the company's purchasing department, I contacted a former colleague with TXI Rebase, a facility that produces roadbase materials. That company was interested in Hensley's foundry sand as a filler and stabilizer. Big City Concrete, a nearby rock and aggregate processor, was happy to team with Hensley to crush, separate, load, and transport the screened sand solids to the roadbase facility. Operation and transport costs were reduced from $60,000 per month to an average of $13,500. During negotiation for the foundry sand beneficial reuse project, Hensley worked with Master Fibers, a company with paper mills in Mexico, and Allied Waste, the company's trash disposal vendor, to set up office paper, cardboard, and wood waste recycling. With the recycling programs, trash compactor pulls were reduced from three times to once a week. This reduced the amount of trash sent to the landfill by two thirds and saved more than $2,000 per month. Consolidated Construction Services, a local wood mulching and blending facility, processes the wood waste for half the cost of a compactor pull. The recycling programs were implemented in stages. The sand screening for beneficial reuse, along with paper and cardboard recycling were started first. Next, wood waste recycling began. Furnace slag screening and crushing were implemented next. Hensley's maintenance and construction managers coordinated the foundry sand screening and hauling. The company's new contract janitorial service, QBuilding Maintenance Company, helped with collection and segregation of paper, cardboard, and wood waste for recycling. By the end of January 2007, every company department was actively involved in recycling. The near impossible had been accomplished – the company's culture had changed from red to green. As of the end of 2008, net savings from all of the recycling programs combined exceeded $1.2 million. Approximately 45 percent of this is directly attributable to recycling and beneficial reuse. The remaining 55 percent is cost avoided for raw material scrap steel and alloys. In addition to the initial primary cost savings, Hensley established other recycling, emission reduction, waste minimization, and source reduction initiatives that provided secondary cost savings and benefits. These initiatives are outlined below. Electronics recycling began in mid-2005 as a direct result of networking with ARC International. ARC assisted Hensley with developing an inventory of old computer equipment and other recyclable electronics. Implementing the electronics recycling program also involved education and awareness briefings for key staff and managers in areas that generate obsolete electronic parts and computer equipment. Since the first pickup of three banded pallets of recyclable electronics, Hensley has maintained its partnership with ARC International. In October 2007, Hensley completed construction of a new foundry building, which incorporates the most current production and pollution abatement technologies, including the first large-scale envelope filter baghouses in the United States. To meet requirements of the Texas construction stormwater general permit, construction entrances had to be paved or stabilized to prevent erosion or tracking of material off site. During ground preparation and excavation, significant amounts of old concrete were removed and leftover residues from new concrete generated. Working with Big City Concrete, Hensley sent these materials to be crushed and returned to stabilize construction entrances and sections of the earthen berm surrounding the site. Carbide electrodes are a dense form of graphite in cylindrical shape. They are used as conduit for the high-voltage plasma electricity that melts the scrap steel charge in the electric arc furnaces. Sometimes, the electrodes develop stress fractures or other weakness after periods of use, which results in breakage. Hensley had stockpiled several tons of the material over four years. Working with the company's furnace additive supplier Asbury Carbon, the company had the electrodes crushed to meet specifications for use as a carbon raiser additive in the furnaces. The cost for recycling 17 tons of electrode material is now less than the cost of the granular coal ($0.10 per pound vs. $0.32 per pound), and a material otherwise disposed of as landfilled waste is now reclaimed and reused. Hensley replaced the wet scrubber used to control catalyst gas emissions from its core making operation. Cores are sand mold inserts used to create voids in metal castings. They are made of special resin-coated sand hardened by the use of a three-part chemical binder system. After combining Part I and II chemical binders with the resin-coated sand in an enclosed box, the formed core is exposed to a volatile organic catalyst gas for several seconds. In this case, the catalyst is triethylamine (TEA), a listed hazardous air pollutant (HAP). The catalyst gas is then evacuated to a wet scrubber to reduce air emissions. The scrubber recirculates a mild acidic water solution that is sprayed inside a tower to entrain the catalyst. The company entered into a supplier agreement with Ashland Specialty Chemicals for its core making chemicals, which gave it access to the Isocycle program. Once the recirculated acidic water is saturated with TEA catalyst, the spent core scrubber wastewater is sent for reclamation. Texas Molecular, under contract to Ashland, reclaims the TEA catalyst from the wastewater, purifies it, and markets it back to Ashland. Scrubber water, when recycled, is exempt from the definition of Resource Conservation and Recovery Act solid waste, resulting in reduced regulatory requirements. Additionally, the cost for recycling the scrubber water as a non-regulated material is one-third that of off-site treatment and disposal of the effluent as a hazardous waste. The new core scrubber reduced HAP emissions of TEA by 2.3 tons per year. Additional HAP reduction was achieved by switching to water-based paints for castings finishing and investigating use of low-HAP mold making chemicals. These process changes have translated into HAP emission reductions of nearly 15 tons per year. 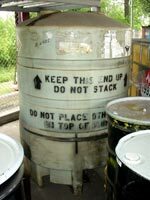 Drum recycling has been accomplished by requiring suppliers of bulk chemicals to take back empty containers in good condition. This requirement is included in each vendor contract where possible. As a result of a routine annual insurance audit, Hensley's safety and environmental committee investigated alternatives to improve fire protection and spill containment for mold wash mixing and storage adjacent to the foundry pouring floors. 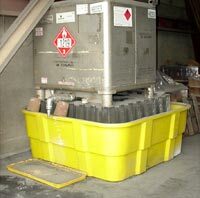 As a result of this internal evaluation, the company began receiving bulk isopropanol in 300-gallon refillable steel totes. The change results in a savings of approximately $2,000 per year, and eliminates generation of used isopropyl alcohol drums. Hensley increased the level of cardboard fiber recycling by separately collecting Gaylord-sized "supersacks." 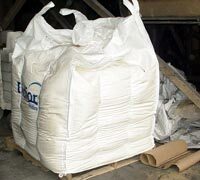 Corn meal (used as a sand binder), certain types of shell mold sand, and ladle liner sand is received in these large, square bags. To further enhance recycling revenue from scrap metals sent for off site reclamation, Hensley began collecting aluminum and copper separately, because the market value for these commodities makes it worthwhile. In the last quarter of 2007, Hensley began recycling printer and toner cartridges. The facility also implemented a pilot program to recycle certain types of plastics from shipping containers, packing materials, water and soda bottles, and shrink wrapping. The cost savings and rebates for these items will be tracked as line items in the facility's master recycling spreadsheet database. 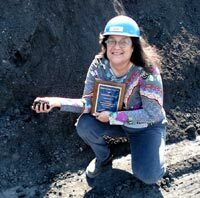 The Academy of Certified Hazardous Materials Managers has named Diana Lundelius the 2008 Hazardous Materials Manager of the Year. Diana is a Certified Hazardous Materials Manager at the Master level. She was recognized at the ACHMM national conference on Sept. 9 in Minneapolis, Minn., and presented a paper on her company’s award winning achievements. Another project started in 2007 is the installation of pelletizers for electric arc furnace and sand plant baghouse dusts. Furnace dust is a listed hazardous waste. Pelletizing it will allow Hensley to back charge the furnaces with the material in a manner that does not cause nuisance dust, thereby reducing particulate emissions. The pelletized dust also is a source of recoverable alloy metals. Separately pelletizing sand baghouse dust will improve the characteristics of the screened sand for beneficial reuse applications and create another byproduct for separate potential beneficial reuse. Lundelius and the recycling team received the company's Presidential Award in May 2007. The Recycling Alliance of Texas selected Hensley as the winner of the 2007 Award for Outstanding Integrated Solid Waste Program, and the North Texas Corporate Recycling Association presented the company with a first-place award in the category of "Business with Greater Than 100 Employees/Recycling." Hensley also became a Clean Texas Bronze Level facility in May 2008.